We bought our travel insurance straight after buying our round the world tickets. After all, if you have to cancel the trip, it’s best to have insurance in place. We got it through Columbus and to be fair it was not expensive – something like £200 for the whole family for nearly 12 weeks worldwide cover (excluding North America). It also came with an impressive list of allowed activities including tobogganing, camel riding and water skiing. 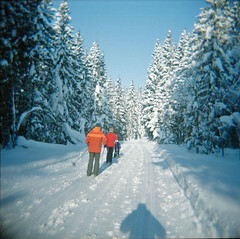 I realised later that one thing that we were thinking of doing was not covered – cross country skiing. We will be flying into Queenstown in the south of New Zealand in ski season and we’re not skiers, so we have a booking to learn cross country skiing, which you can pick up in a matter of hours apparently. The place that offers it is the Snow Farm near Wanaka. With all of those other activities covered, many of which look more risky than cross county skiing, I phoned to ask what it would cost to add a single day of that activity to our policy. I was quoted £50. Not a huge sum, but large compared to the basic policy and a large additional cost for one day’s cover. I think the problem is that the premiums are set up assuming that you are going on a ski holiday, rather than spending one day out of eighty in the mountains. So I held onto my money. Looking around I discovered that it is possible to buy top-up cover for just this situation. DareDirect and SportsCover Direct will allow you to buy single days of cover for extra activities. This was about half the cost of the additional premium from Columbus. Even more interestingly, New Zealand has a government backed insurance scheme that covers visitors as well as residents for personal injury. So maybe we don’t need to buy any top up at all?